Veeam is best known for its enterprise and business offerings in the cloud. 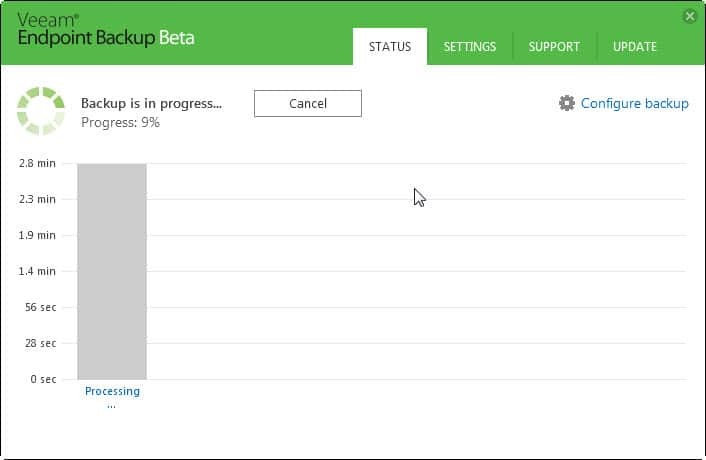 The company released a free backup application recently called Veeam Endpoint Backup Free which is currently available as a beta version. The product should not be confused with Veeam Backup Free Edition which is also available. The main difference between the two is that the latter enables you to backup virtual environments while the former Windows-based desktop and laptop PCs. The first thing you notice after download is that it is quite large. The program has a size of about 230 Megabyte which is a lot even for a backup program. The size is partially explained by the additional components the program requires and the installer ships with. When you run the installer you see that it requires Microsoft SQL Server System CLR Types, Microsoft SQL Server 2012 Management Objects and SQL Server 2012 Express LocalDB which will get installed on the system if not available already. 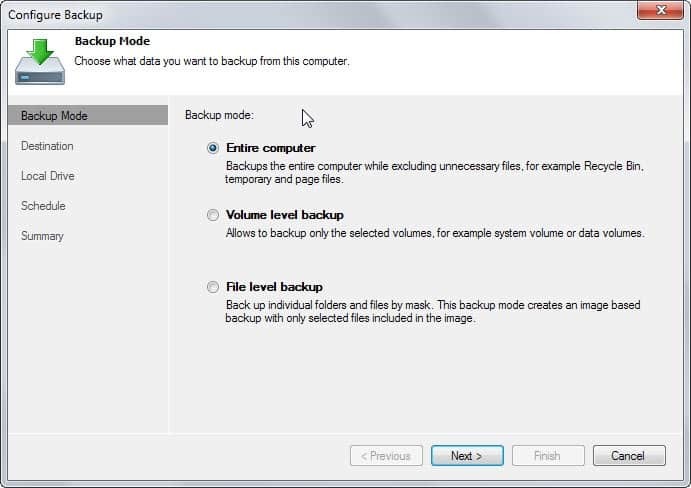 The backup program supports three core backup options to backup the entire computer, do a volume level backup or file level backup. Entire computer - backs up everything except unnecessary files such as temporary files or the page file. This is basically a file level backup that backs up all files except of temporary ones. Volume level backup - allows you to create an image of a data volume (known as logical drive or partition). File level backup - select the files and folders that you want to back up. The program walks you through the configuration steps. Once you have selected the type of backup that you want to perform, you select where you want to save it and whether you want to schedule the backup so that it runs periodically or when events such as log off trigger. You will notice that it is currently only possible to store the backup on a local drive or shared folder. The third option, Veeam Backup & Replication repository is only available if your system has access to a Veeam Backup & Replication Server. The program offers to create a recovery disc after installation. This disc can be used to boot into a recovery environment to restore files or entire volumes on the system. The recovery tool is available in the start menu as well from where it can be accessed. Volumes and files can be restored while the system is running. One interesting option is the ability to restore individual files from a backup instead of the complete backup. This is done using the system tray icon of the application. The main program interface displays only a few settings. It lists the status of any backup running currently, offers a link to create a new one, and offers a couple of settings. It will throttle backup activity for example when the system is busy. The only other options are to disable scheduled backups and notifications, and to show the backup size instead of the duration. Veeam Endpoint Backup Free is a professional backup solution. While designed with home users in mind, its size and dependency on third-party components makes it a heavyweight in the backup category. The beta software lacks features that good free backup solutions offer. This includes compression or encryption for example. The company plans to launch the final version of the program soon. No rating since it is beta. Veeam Endpoint Backup Free is a new backup solution for client and server Windows PCs. We take a first look at it and provide you with details. It does? I could not find any options to control it. Is it automatic? Yes. The first backup I did was a volume-level backup of my C:\ drive. Used space is 94.2GB, but the .vbk was only 22GB. You forgot to mention on the download size: add megs and megs more for Windows updates on SQL related apps. I avoid any software that uses MS SQL unless there is a real need for it; and while for enterprises there is, for the typical home computer there isn’t. With some research, you will find that SQL LocalDB is very different from regular SQL Server. I’ve found this software interesting as a valid alternative to the common Macrium Reflect and Aomei Backupper. Firstly, the free version is basically a fully working software minus some Server related functions, but who cares. Secondly, its media restore includes some interesting tools such as an administrator password reset utility and others. It would be interesting to know more about this software for things like reliability and backup compression sizes.